As with all of Barrel O' Fun's new packaging designs, this simple, basic, and modern look is ideal for the shelves. It stands out and contrasts perfectly with the other colors in their range. We would like to see some broken cheddar instead of a bowl or potatoes. And the colour; brownish orange, doesn't really scream the correct flavor. The Chips are thin, which probably means the factory manages to get every Chip from a potato that is possible. This didn't mean there were lots of broken Chips though - the bag has sufficient air to ensure most are intact. The crunch is a crisp, thin crunch, rather than a meaty, thick crunch. Some Chips had sections of the edges that were visibly the potato skin, which offers up a fresh taste in the mind. The seasoning was a mild dusting and there was little residue left on the fingers after a plunge into the bag. 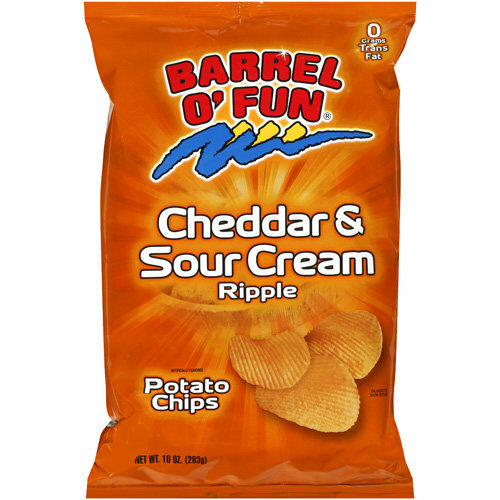 There is a good cheesy aroma when you open the bag and although Sour Cream is a regular accompaniment to the Cheese flavor with Potato Chips, it is rarely noticeable. As with these it is used more as a way of tempering a strong flavor, which makes these fairly straightforward and average within their peers.